There has been a recognisable community of Chinese people in Korea, also known as Chinese Koreans, since the 1880s. Most early migrants came from Shandong province on the east coast of China; many of them and their descendants have emigrated. However, the reform and opening up of the People's Republic of China (PRC) and the normalisation of People's Republic of China – South Korea relations has resulted in a new wave of Chinese migration to South Korea. In 2009, more than half of the South Korea's 1.1 million foreign residents were PRC citizens; 71% of those are Chosŏnjok, PRC citizens of Korean ethnicity. There is also a small community of PRC citizens in North Korea. When writing in English, scholars use a number of different terms to refer to Chinese people in Korea, often derived from Sino-Korean vocabulary. One common one is yeohan hwagyo (Korean) or lühan huaqiao (Mandarin), meaning "Chinese staying in Korea". The Korean reading is often shortened to hwagyo (also spelled huakyo), which simply means "overseas Chinese" but in English literature typically refers specifically to the overseas Chinese of Korea. Other authors call them huaqiao, but this term might be used to refer to overseas Chinese in any country, not just Korea, so sometimes a qualifier is added, for example "Korean-Huaqiao". The terms "Chinese Korean" and "Korean Chinese" are also seen. However, this usage may be confused with Koreans in China, who are also referred to by both such names. Jizi came to Korea during the Shang dynasty and established Gija Joseon and Wiman of Gojoseon came from Han dynasty China and established Wiman Joseon. Chinese colonists settled in the Four Commanderies of Han after the Han dynasty conquered Wiman Joseon, especially in Lelang Commandery. At Lelang Han colonies of peasants were settled there. Other minority ethnicities from China such as the Xianbei, Khitan, and Jurchen also migrated into the Korean peninsula. Fleeing from the Mongols, in 1216 the Khitans invaded Goryeo and defeated the Korean armies multiple times, even reaching the gates of the capital and raiding deep into the south, but were defeated by Korean General Kim Chwi-ryeo who pushed them back north to Pyongan, where the remaining Khitans were finished off by allied Mongol-Goryeo forces in 1219. These Khitans are possibly the origin of the Baekjeong. Xianbei descendants among the Korean population carry surnames such as Mo 모 Chinese: 慕; pinyin: mù; Wade–Giles: mu (shortened from Murong), Seok Sŏk Sek 석 Chinese: 石; pinyin: shí; Wade–Giles: shih (shortened from Wushilan 烏石蘭, Won Wŏn 원 Chinese: 元; pinyin: yuán; Wade–Giles: yüan (the adopted Chinese surname of the Tuoba), Dokgo Chinese: 獨孤; pinyin: Dúgū; Wade–Giles: Tuku (from Dugu). One of Mencius' descendants moved to Korea and founded the Sinchang Maeng clan. A Chinese descended from a student of Confucius founded the Muncheon Gong clan and Gimpo Gong clan in Korea. Two Japanese families, a Vietnamese family, an Arab family, a Uighur family, four Manchuria originated families, three Mongol families, and 83 Chinese families migrated into Korea during Goryeo. Goryeo era Korea accepted Lý Dynasty royals refugees. The Lý were of Chinese ethnicity. Fujian province, Jinjiang village was the origin of Lý Thái Tổ 李公蘊, the ancestor of the Lý dynasty ruling family. China, Fujian was the home of Lý Công Uẩn. The ethnic Chinese background of Lý Công Uẩn has been accepted by Vietnamese historian Trần Quốc Vượng. Chen Li went to Korea. The Chinese rebel leader Ming Yuzhen's son Ming Sheng went to Korea and founded the Yeonan Myeong clan, Seochok Myeong clan and Namwon Seung clan. Individual Chinese are recorded on the Korean peninsula as early as the 13th century, with some going on to found Korean clans. However, there was little recognisable community until July 1882, when the Qing Dynasty sent Admiral Wu Changqing (吳長慶) and 3,000 troops at the request of the Korean government to aid in quelling a rebellion. Accompanying the troops were some 40 Chinese merchants and other civilians. In August that same year, Qing Superintendent for Trade for the Northern Ports Li Hongzhang lifted restrictions on coastal trade and signed the Regulations for Maritime and Overland Trade Between Chinese and Korean Subjects, and two further agreements the following year, which granted Chinese merchants permission to trade in Korea. Unlike in other Asian countries, 90% of the early overseas Chinese in Korea came from Shandong, rather than the southern coastal provinces of Guangdong and Fujian. During the late 19th and early 20th century Shandong was hard hit by famine, drought, and banditry especially in its northwest, and caused many to migrate to other parts of Shandong, China, and Korea. See Shandong people. Chinese merchants did well in competition with the Japanese due to their superior access to credit. They were not confined to port cities, and many did business in inland parts of Korea. Generally speaking, Japanese traders were more interested in quick profits, while the Chinese established relationships with customers. The earliest Chinese school in Korea, the Joseon Hwagyo Primary School, was established in 1902 in Incheon. By 1910, when Korea formally came under Japanese rule, the number of Chinese in Korea had risen to 12,000. Chinese migrants established schools in Seoul in 1910, Busan in 1912, Sinuiju in 1915, Nampho in 1919, and Wonsan in 1923. The number of Chinese in Korea would expand to 82,661 by 1942, but contracted sharply to 12,648 by 1945 due to economic hardships faced during World War II. Prior to and during the Korean War, many Chinese residing in the northern half of the Korean peninsula migrated to the southern half. After the division of Korea, the Chinese population in South Korea would remain stable for some time; however, when Park Chung Hee took power in a coup on May 16, 1961, he began to implement currency reforms and property restrictions which severely harmed the interests of the Chinese community, spurring an exodus. Incheon once had the largest Chinese population in Korea, but as the pace of emigration increased, the number diminished. It is estimated that only 26,700 of the old Chinese community now remain in South Korea; they largely hold Republic of China nationality. However, in recent years, immigration from mainland China has increased; 696,861 persons of PRC nationality have immigrated to South Korea, making them 55.1% of the total 1,139,283 foreign citizens living in South Korea. Among them are 488,100 of Korean descent (70% of PRC citizens in South Korea, and 40% of the total number of foreign citizens), and 208,761 of other ethnicities. Most of these new residents live in Seoul and its surroundings. There is a Chinese-language primary school in Myeongdong, as well as a high school in Seodaemun. After the surrender of Japan and the liberation of Korea from Japanese rule, Chinese living in the northern half of Korea quickly established new schools and rebuilt Chinese-language education, with aid from the Communist Party of China (CPC). In April 1949, the CPC's Northeast Administrative Committee formally handed control of these schools over to the North Korean government, which began some efforts to integrate them into the national educational system. Early financial assistance from the North Korean government actually helped to maintain and expand Chinese education; the schools continued operation even during the Korean War, and the era after the cessation of hostilities up to around 1966 was described as a "golden era" for the schools. After that time, the North Korean government began to pursue a policy of reform and indigenisation towards the schools. However, as of the late 1990s, there were still four Chinese middle schools which followed the PRC curriculum. Some of their graduates go on to PRC universities; for example, Jinan University in Guangzhou had over 100 overseas Chinese students from North Korea as of 2002[update]. Yanbian University in the Yanbian Korean Autonomous Prefecture of China also began offering training programmes for teachers in overseas Chinese schools in North Korea beginning in 2002; 38 students from their first class graduated in 2005. Being foreign citizens, North Korea's Chinese people were not eligible to join the ruling Korean Workers Party or advance in the military or the civil bureaucracy. On the other hand, they were allowed somewhat greater freedoms, such as the right to own a radio that was not sealed to only allow being tuned to North Korean stations (as long they did not listen to foreign stations in the presence of North Koreans). More importantly, since around 1980 they were allowed to travel abroad, and participate in the important and profitable export-import business. After the PRC government came out in support of United Nations Security Council Resolution 1874 in June 2009, which imposed sanctions in North Korea, it was reported that North Korean surveillance and repression of Chinese residents had increased, and many had chosen to avoid making trips out of the country to avoid scrutiny. One Chinese resident was allegedly charged with espionage. The population of PRC citizens in North Korea was estimated as 14,351 persons (in 3,778 households) in 1958, shrinking to a mere 6,000 by 1980, as they had been encouraged by the North Korean government to leave for China in the 1960s and 70s. Recent estimates of their population vary. China's official Xinhua News Agency published a figure of 4,000 overseas Chinese and 100 international students in 2008. The Chosun Ilbo, a South Korean newspaper, gave a higher estimate of 10,000 people in 2009. They live mostly in Pyongyang and in the areas near the Chinese border. Due to the South Korean regulations in the 1960s which limited foreign property ownership, many Chinese in South Korea left the country. During the 1970s, 15,000 are estimated to have moved to the United States, and another 10,000 to Taiwan. Further outmigration occurred during the 1997 Asian Financial Crisis. Others went to the PRC after its reform and opening up, to pursue commercial opportunities or simply to return to their ancestral hometowns. For example, in Rizhao, Shandong alone, there are 8,200 returned overseas Chinese. Many Chinese from Korea who migrated to the U.S. have settled in areas with large Korean American communities, such as Los Angeles, and they have tended to integrate into the Korean American rather than Chinese American community. Yet, some who went to the United States or Taiwan found they could not adapt to life there either due to linguistic and cultural barriers, and ended up returning to South Korea, in a form of circular migration. Overseas Chinese are person that born in China, settled in other countries and is working in that country. The origin of the Overseas Chinese in Korea can find in the Im-O Military Revolt in 1882. At that time, Chinese 吳長慶 came to fetch the Chinese military 4000 people in order to rectify the Im-O Military Revolt in Korea, and the settlement of Overseas Chinese began from the Qing Dynasty merchants that came along to procure munitions. As Qing Dynasty 租界地 was set to near Incheon Jemulpo Port in 1884, in earnest, the Overseas Chinese came to Korea and was nationally spread. But, overseas Chinese society is atrophied because of Various institutional limits and discrimination of our government. Since then, Korea conducted favorable policy for foreign In 1998, overseas Chinese has become increasingly stable as 22,917 people In 2001. And The rise of China and the 21st century global era, especially, Since the 1997 IMF crisis, as importance of foreign capital was emphasized, Overseas Chinese in Korea has arranged the foundation of a new leap forward. 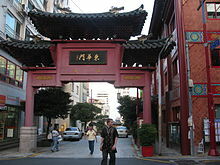 It has been documented that most Chinese in South Korea are followers of Chinese folk religion, Buddhism and Taoism. Chinese have established some folk temples dedicated to various gods, which provide networks linking back to mainland China or Taiwan. Otherwise, there are no formal Chinese Buddhist and Taoist temples in Korea. Chinese Buddhist attend temples of Korean Buddhism. Many Chinese belong to Yiguandao, a religious movement originating from Chinese folk religion. Since the 1990s, Christianity has made some inroads among the Chinese of Korea, with at least one Chinese-language church established by a pastor from Taiwan. Chinese Catholics attend Korean Catholic churches. ^ "Propaganda in the age of Kim Jong-Un: A discussion with Professor B.R. Myers". Freekorea.us. Retrieved 17 August 2018. ^ Historical Atlas of the Classical World, 500 BC--AD 600. Barnes & Noble Books. 2000. p. 2.24. ISBN 978-0-7607-1973-2. ^ Patricia Ebrey; Anne Walthall (1 January 2013). Pre-Modern East Asia: A Cultural, Social, and Political History, Volume I: To 1800. Cengage Learning. pp. 177–. ISBN 1-133-60651-2. ^ "성씨정보 - 남원독고씨 (南原 獨孤氏) - 시조(始祖) : 독고신(獨孤信)". Surname.info. Retrieved 29 August 2017. ^ "성씨정보 - 독고씨 (獨孤氏) - 인구 분포도 (人口 分布圖)". Surname.info. Retrieved 29 August 2017. ^ "씨(獨孤氏)의 본관 :: 뿌리를 찾아서 ::". Rootsinfo.co.kr. Retrieved 29 August 2017. ^ 사이트, 효문화. "성씨유래검색> 효문화 사이트". hyo.djjunggu.go.kr. Retrieved 29 August 2017. ^ "FamilySearch Catalog: 남원독고씨족보 南原獨孤氏族譜, 2권, 930-1935 — FamilySearch.org". familysearch.org. Retrieved 29 August 2017. ^ "성씨정보 - 남원 독고씨 (南原獨孤氏) - 상계 세계도(上系世系圖)". Surname.info. Retrieved 29 August 2017. ^ "성씨정보 - 남원독고씨 (南原 獨孤氏) - 인구 분포도 (人口 分布圖)". Surname.info. Retrieved 29 August 2017. ^ "Descendants of Confucius in South Korea Seek Roots in Quzhou". QUZHOU.CHINA. 19 May 2014. Archived from the original on 4 February 2015. Retrieved February 4, 2015. ^ "Welcome to the US Petabox". 12 July 2013. Archived from the original Check |url= value (help) on 12 July 2013. Retrieved 17 August 2018. ^ "South Korea home to 80,000 descendants of Confucius - People's Daily Online". En.people.cn. Retrieved 18 August 2016. ^ "New Confucius Genealogy out next year -- china.org.cn". China.org.cn. Retrieved 29 August 2017. ^ "China Exclusive: Korean Confucius descendants trace back to ancestor of family tree - China.org.cn". China.org.cn. Retrieved 29 August 2017. ^ "China Exclusive: Korean Confucius descendants trace back to ancestor of family tree". Xinhuanet.com. Retrieved 18 August 2016. ^ "The Stranger Kings of the Lý and Trần Dynasties". Leminhkhai.wordpress.com. 7 September 2013. Retrieved 18 August 2016. ^ "千年前泉州人李公蕴越南当皇帝 越南史上重要人物之一 - 城事 - 东南网". Fjsen.com. Retrieved 29 August 2017. ^ "两安海人曾是安南皇帝 有关专家考证李公蕴、陈日煚籍属晋江安海-泉州网". Qzwb.com. Retrieved 29 August 2017. ^ For example, the Deoksu Jang clan, founded by a Hui Chinese in 1275. See "덕수장씨 (Deoksu Jang Clan)". Rootsinfo.co.kr (Korean language). Archived from the original on 2005-11-19. Retrieved 2006-12-08. ^ a b "[특별기고] 한국 화교 그 애잔한 이름 - 일간투데이". Dtoday.co.kr. Retrieved 2015-12-07. ^ a b "한국화교이야기 > 한국화교현황 | 인천차이나타운". Ichinatown.or.kr. Retrieved 2015-12-07. ^ "[수도권] '130년 역사' 화교들, 인천 떠난다…왜?". SBS NEWS (in Korean). Retrieved 2015-12-07. ^ "한국은 화교자본 성공 못한 유일한 나라…인천특구·새만금도 외면". Mk.co.kr. Retrieved 2015-12-07. ^ "한국화교이야기 > 한국화교현황 | 인천차이나타운". Ichinatown.or.kr. Retrieved 2015-12-07. ^ "인천시립박물관 특별전 '오래된 이웃, 화교'". Ajunews.com (in Korean). Retrieved 2015-12-07.